Co-op gaming is taken to a whole new level... by riding an elevator? Ever play a game where riding an elevator is your main and only objective? No? Well, you’re in luck, because that’s exactly what you’re getting when you download Pixeltail’s newest game, Elevator: Source. 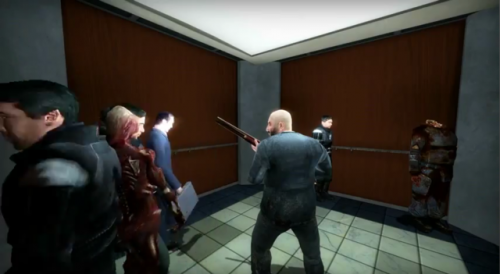 An innovative use of Garry’s Mod within Valve's Half-Life 2, Elevator: Source brings players a simple, yet mysterious game of “28 randomly generated floors of realistic elevator physics” which will have you rolling on the floor in laughter within minutes. Now, you might be asking yourself, “Why even play if it’s just a moving elevator?” Good question, but that’s the quintessential beauty of the game. Where and what the elevator will stop on is what makes Elevator: Source so hard to quit playing. The random “floors” where you automatically stop to either pick up other NPC passengers or view sceneries (sometimes being completely ridiculous or incredibly terrifying) can throw you totally off guard and make you thirsty for more. The only catch of the game is that you’re never allowed to leave the elevator. Being cooped up in a tiny room with only 3 allowable actions (checking your watch, bringing up your hand to cough, or a slapping action) might seem like a complete waste of gaming time to a gamer on a schedule, but riding only a few floors of this elevator spells genius to community game developers everywhere. You can download Pixeltail's Elevator: Source from their website here, just be sure to have Half-Life 2 AND Garry’s Mod downloaded first. Page created in 0.8006 seconds.